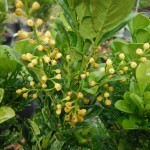 Chinese Perfume Tree - Richard Lyons Nursery, Inc. The Chinese Perfume Tree, Aglaia odorata, differs from a lot of fragrant species in that its strongest scent is not confined to a certain time of day. Rather, its perfume waxes and wanes throughout the day. 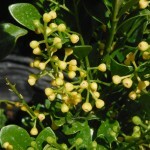 This evergreen shrub, which may reach 10-15 ft. slowly in southern Florida, produces small yellow, ball-shaped flowers whether planted in full sun or light shade. From the same family as Mahogany, the Chinese Perfume Tree is native not just to China, but well into southeast Asia. It can be left to grow informally, but is also very amenable to pruning into a hedge or small tree. 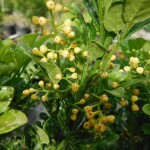 This glossy-leafed plant has become particularly desirable these days as an alternative to Orange Jasmine, Murraya paniculata, which is susceptible to Citrus Greening Disease. In addition to its sweet fragrance and ease of growth, Aglaia odorata is hardy into the upper 20s and perhaps lower, and has proven successful as a landscape plant from southern to central Florida. It is available at Richard Lyons’ Nursery in 7-gal. containers.